To analyse the effects of cosmetics on human skin, the gold standard remains histological examination. 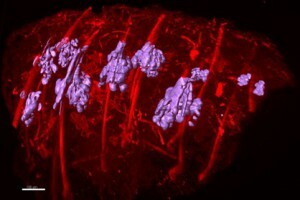 However, this method only allows to observe tissue sections in 2D, whereas natural human skin is organized in a 3D structure. In a recently published study, Syntivia’s Sophie Abadie combined optical clearing and light-sheet fluorescence microscopy (LSFM) to generate 3D images that allow us to reflect the complete picture of effects cosmetic ingredients have on human skin. Human skin is a large opaque organ covering the body. It provides an efficient barrier to the external environment and is organized in a 3D structure. Human skin is composed of three layers: the stratified cellular epidermis, the dermis made of connective tissue, and the subcutaneous tissue composed of fat cells. Skin appendages are organized perpendicularly to these layers: they originate from the dermis or the hypodermis and connect to the epidermis. Skin appendages include sweat glands, sebaceous glands, hair follicles and erector pili muscles. Human skin is also connected to nervous, vascular and lymphatic systems, which are also organized in a perpendicular plane to the skin surface. Studying the effects of cosmetics on human skin remains a challenge. First of all, due to the skin structure itself, which doesn’t allow microscopes to penetrate the skin layers in depth but also, due to the technical limitations of the tools used. Observation of human skin morphology in 3D. (A) Methodology to obtain volume rendering with light-sheet fluorescence microscopy (LSFM). Volume rendering of Z-stack acquisition was obtained using Amira® software. (B) Slice at 0 μm, (C) 460 μm, (D) 1200 μm and (E) 1400 μm depth is shown. 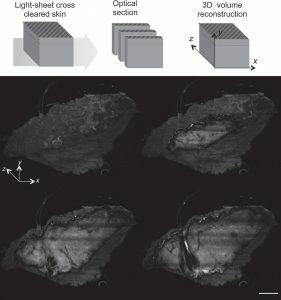 To counter the imaging issues caused by skin structure, chemical processing techniques have been developed to render tissues transparent and enable deep imaging. Optical clearing relies on the homogenization of all refractive indices of a tissue by replacing components of low-refractive index, such as water, by an oil-like medium that has a refractive index closer to that of proteins and lipids. As a consequence, light scattering is strongly reduced and greatly improves in-depth light penetration. Most microscopes share limitations in penetration depth due to light scattering, which compromises their use for the analysis of 3D objects. Light-sheet fluorescence microscopy (LSFM), by contrast, is an attractive option. The principle of LSFM is to illuminate a single planar portion of a specific sample with a sheet-shaped light beam. Detection of the emitted signal is performed perpendicularly to the illumination plane. This imaging configuration limits photobleaching, allows to quickly collect images of an entire plane as well as volumetric data to enable the objects optical reconstruction in 3D. The new approach of combining optically cleared biopsies with 3D LSFM imaging opens up new possibilities to study the efficacy of cosmetic actives on human skin. It allows to analyze the different skin compartments and appendages in depth and to optically reconstruct an entire human skin biopsy in 3D. The tool will be particularly useful for cosmetic and dermatological research to study normal skin morphology and analyse morphological changes associated with the (premature) aging of human skin, the effects of skin care products and cosmetics for UV-protection. The new study tool will be a valuable addition to the wide range of in vitro tests and technologies Syntivia’s cosmetic experts already have to offer. Sophie will present her work for the obtention of a PhD at the ITAV, Centre Pierre Potier, 1 place Pierre Potier in Toulouse, France on February 14th, 2018. The study on which this article is based is titled « 3D Imaging of cleared human skin biopsies using light-sheet microscopy: A new way to visualize in-depth skin structure » and was originally published in Skin Research and Technology by John Wiley and Sons on January 27th, 2018. Should you like more information on this new imaging technique, don’t hesitate to contact us.